One of the things that is, unfortunately, universal in boxing are bad decisions. We often see these in high profile fights in the UK, US and Germany who all have a reputation for such things. 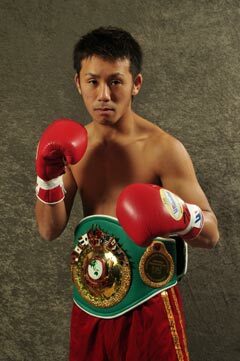 Sadly however they do happen around the world and today we saw the latest addition to the ever growing list of questionable decisions as Japan's Takuya Kogawa (22-4, 13), pictures, was controversially denied the WBA interim Flyweight title. Kogawa travelled to Thailand, a country that has been less than friendly to championship level Japanese fighters in the past, and gave his all in a thoroughly compelling contest with Thailand's very own Yodmongkol Vor Saengthep (34-2, 20). It was an effort that should have seen Kogawa claim the belt but some how the judges denied him. The Japanese challenger started fast. He used his natural hand speed and movement to simply out work Yodmongkol who plodded along with his guard up and. Whilst much of Kogawa's work was blocked enough had gotten through for him to win the round with out much debate. The same also applied in round 2, even though Yodmongkol did manage to find himself landing more than he had in the opening round. Following the great start of the champion things had began to get interesting and Kogawa was being caught more frequently with some classy punches from Yodmongkol. Whilst the champion was beginning to land the better punches it again seemed to be the work rate of Kogawa that left the lasting impression and not the occasional, albeit heavier, shots of the Thai. It seemed that every time Yodmongkol would land something Kogawa would fire back in a short little flurry of punches that continued to catch the eye. Through the middle rounds the fight began to change slightly. For the first 4 rounds it was all about Kogawa's high out put against Yodmongkol's heavier though less frequent shots. Kogawa was boxing on the move, creating space with his feet and firing off combinations whilst Yodmongkol applied constant though somewhat ineffective pressure. In round 5 though that pressure began to get him closer to the challenger and the crowd began to encourage their man. Although behind at the mid way point Yodmongkol seemed a lot fresher than the challenger and in round 7 he began to force his fight on Kogawa. This saw the two men enjoying several exchanges as the fight began to represent more of a toe-to-toe battle than anything else. It was clear that this was what Yodmongkol was going to prefer and what was going to really help him if he was to turn the fight around. Surprisingly however Kogawa's hand speed kept him very much in these exchanges and on numerous occasions he was the one forcing Yodmongkol on to the back foot. It was clear the pace had increased in round 7 and that Yodmongkol knew he his title was slipping away if things had remained as they were in the first 6 rounds. The Thai continued to up the pace in round 8 and it finally seemed that he was beginning to get the upper hand in the exchanges with the commentators becoming hugely excited at one point with Kogawa forced to take shots. Amazingly though Kogawa recovered and seemed to be on the front foot by the end of the round. Round 7 and 8 had been great though things were just getting better and in round 9 the pace increased again. This round saw Yodmongkol landing 3 flush shots one after the other and it seemed Kogawa was in trouble for a moment though the Japanese fighter recovered swiftly and fired back in an attempt to say “I've still got more fight in me”. It was a brave effort from Kogawa though one that was probably futile in attempting to win the round even though he did more than just see it out. Kogawa's work rate was always going to catch up with him eventually and that seemed to happen in round 10 as Yodmongkol came on really strong and Kogawa began to look weary. The sharp combinations from earlier in the fight were starting to look ragged, the footwork was becoming sloppy and the shots that Yodmongkol was landing seemed to hurt Kogawa for the first time. It was a clear Yodmongkol round and it seemed like the beginning of the end for Kogawa who looked like he was on his last legs. The success of the champion in round 10 was repeated again in round 11 as the Thai continued to come on strong. It was obvious by now that Yodmongkol thought his title was slipping away and that he might even need a stoppage to retain the title. A Japanese fighter's spirit however is hard to break and the round finished with both guys trading shots to the bell as Kogawa summoned up some energy from somewhere. We have no idea how Kogawa had the gas to finish round 11 so well but he found extra reserves in an amazing round 12. From the opening bell to the final bell Kogawa threw relentlessly his combinations just rained down on Yodmongkol who seemed to have his guard pinned up as a result of the relentless, albeit inaccurate, maelstrom of punches coming from the challenger. For the previous 2 rounds Kogawa had looked spent, like he was running on fumes but in round 12 he looked like the energizer bunny. Yodmongkol did attempt to fire back occasionally and landed some solid shots of his own though they were infrequent and seemed to cause Kogawa to bite down on his gum shield and just unload more shots. It was crazy from the Japanese fighter who was showing his will to win was still there as he went all in. By the time the final bell came Kogawa must have thrown well in excess of 100 punches in the final round. Sadly when you fight on foreign soil against the champion you sometimes need a KO for the draw and that seemed to be the case here with Yodmongkol receiving a majority decision win with scores of 114-114, 115-114, 116-113. For purposes of interest, we had it 116-112 Kogawa. The Japanese fighter had every right to be aggrieved though he seemed too exhausted to even think about complaining. He had put everything in to the fight only to have the judges deny him of a belt he had rightfully deserved. As for Yodmongkol he showed his class and seemed to look like a man who was relieved more than happy. There was little celebration from the champion who went through the formalities and probably thanked his lucky stars for a very debatable and controversial decision. We know we thought Yodmongkol would retain and we knew the fight would be exciting but we didn't think that Yodmongkol would be so lucky or that the fight would be THIS good. If you missed it, you missed a thriller.